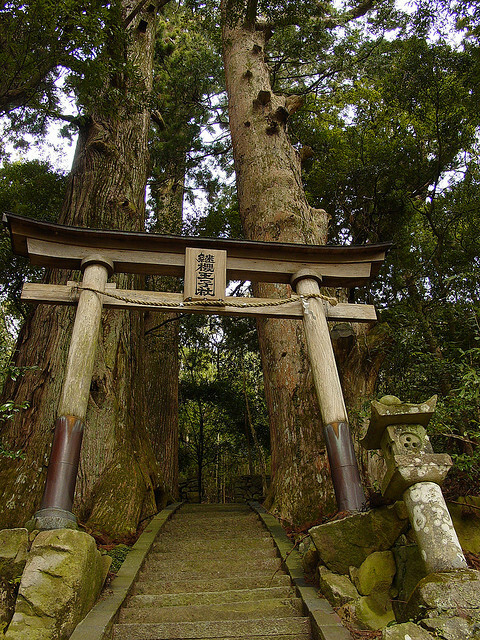 The Kii Peninsula in Japan is the location of a remarkable network of old pilgrimage trails known as the Kumano Kodo. Apart from the Camino de Santiago (St. James Way) in Spain, these are the only pilgrimage routes that received World Heritage status. The hilly area of the Kii Peninsula is covered with temperate rain forest and sparsely populated. The mountains, forests and streams are a place of worship for followers of Shinto since ancient times. Shrines and monasteries grew and with the arrival of Buddhism in Japan after 500 AD, these places became sacred to both religions. Pilgrimages to the Kii area are known for more than 1,000 years. The imperial cities of Nara and Kyoto lie towards the North of the peninsula and are only 150 and 180 km away from the heart of the remote forests. 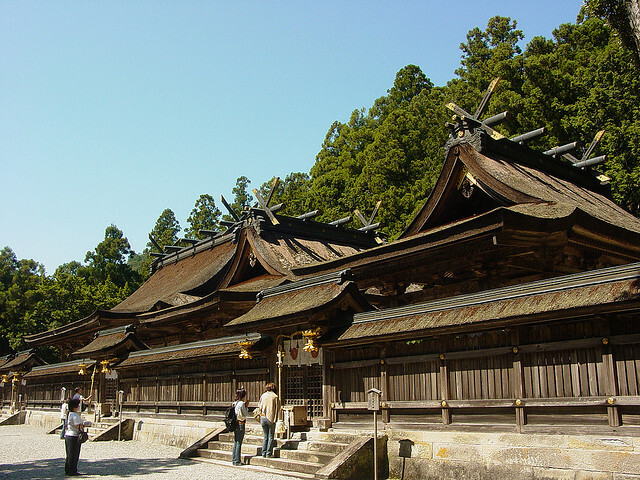 The emperors frequently traveled to shrines in Kii Peninsula. Over the centuries people from all areas of society made these journeys and a network of pilgrimage trails developed. There are paths along both the West Coast from Osaka (Kiji route) and the East Coast form Ise (Iseji Route). The destination of most of the routes are the three Kumano shrines, which are collectively known as Kumano Sanzan: Hongu Taisha, Hatayama Taisha and Nachi Taisha. From Tanabe on the West Coast, there is the Ohechi route, which connects Tanabe and Kumano Sanzan along the South Coast. Most famous however, is probably the imperial Nakahechi route, which takes pilgrims from Tanabe into the heart of the Kii Peninsula and to Hongu Taisha. Within the green forests, small Oji shrines lie on the way, which protect the pilgrims and are a place to rest. Before arriving at Hongu Taisha, the main shrine, a natural hot spring, an Onsen, at Yunomine is a place for a ritual bath. From Hongu Taisha to Hatayama Taisha, the pilgrimage continues by boat, a very unique way for such a spiritual journey. The Kumano River takes pilgrims almost to the ocean before the shrine is reached. Nachi Taisha, the third of the Kumano shrines, lies in the mountains vis-a-vis one of Japan’s highest waterfalls. Here, a hollow, centuries-old tree is part of the shrine complex. From Hongu Taisha, difficult mountain trails continue north to Koyasan. This is an ancient monastery, which developed into a community of 120 temples and a center of Buddhist studies in Japan. Many of the temples offer accommodation making a visit a remarkable experience. Further east lies Omine, one of the most sacred mountains in Japan and the Yoshino area, where over 30,000 cherry trees are cultivated for spectacular cherry blossom viewing. Today, the Kii Peninsula is not as remote as it was in earlier times. Modern roads and railway lines connect it with the urban areas of Japan. Keihanshin, the metropolitan area of Kyoto, Osaka and Kobe is less than 100 km away and home to almost 20 million people. Still, the ancient system of trails leading to the sacred sites survived and are an important part in the spiritual life of the Japanese. Due to the increased popularity since becoming part of the World Heritage in 2004, the Kumano Kodo also attracts tourists from overseas, who can experience this unique part of Japanese culture.